Public awareness is essential if a conservation project is to succeed, particularly with species reintroductions. There was initial concern from the public when the idea of reintroducing choughs to Jersey was mentioned. 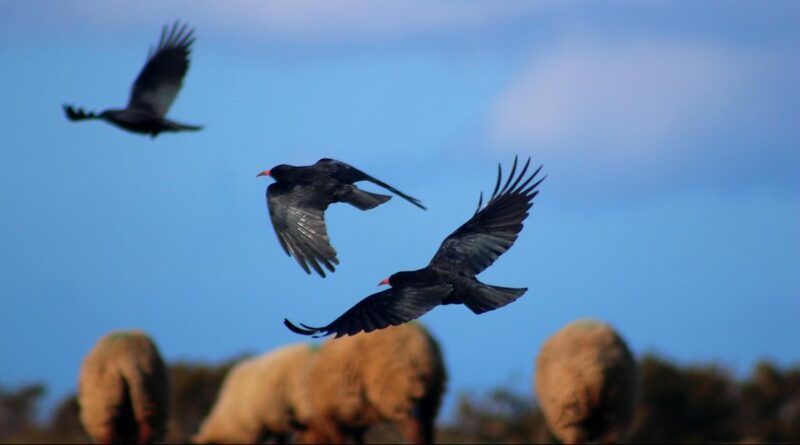 Crows and magpies, close relatives of choughs, are considered pests by a lot of Islanders and can be controlled under Jersey law in order to protect agricultural produce. Choughs are highly specialised feeders only eating insects you tend to find in soil or animal dung. A chough eating a dung beetle in Jersey. Photo by Liz Corry. Public understanding and acceptance of choughs was, therefore, needed to ensure success. In addition, support for the choughs should lead to support for the wider Birds On The Edge project. In turn attracting funding and resources such as public volunteers. 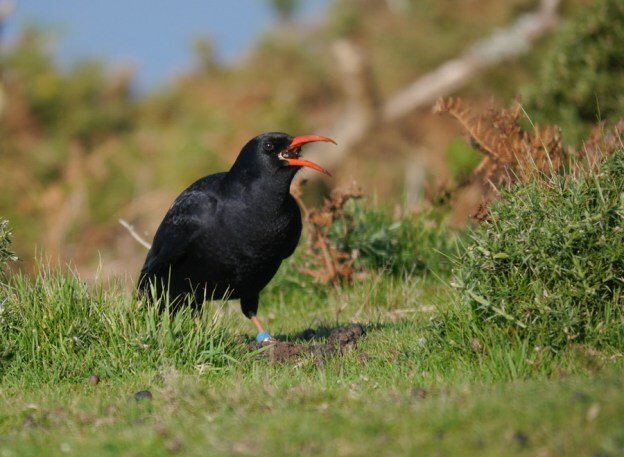 It has now been five years since the first choughs were released into Jersey. We wanted to find out if the Jersey public were aware and what they thought of the species. Two studies were conducted this summer by visiting graduate students; one focused on children, the other on adults. I focused on children as they are a key demographic group at Jersey Zoo. By engaging children in conservation education, they can be inspired to make well informed decisions affecting sustainability in the future, and in this case help to protect the red-billed choughs in Jersey. To conduct the study, I visited eleven of Jersey’s primary schools with a questionnaire for the children to complete before and after an educational presentation on the choughs and Birds On The Edge. Being a Nottinghamshire lass, navigating the back roads of Jersey on a rusty borrowed bike was a challenge in itself! But after a lot of wrong turns and frantic pedalling up and down hills, I manged to interview 16 teachers and 330 children across the Island. Teachers were generally very enthusiastic about including their classes in the study and the children seemed excited to learn about a new mysterious animal. 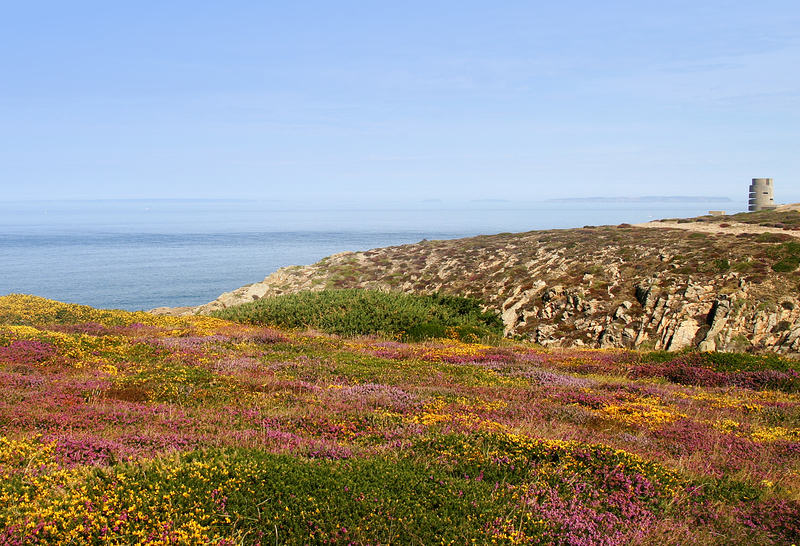 Reintroduced choughs and sheep in Jersey have been working together to improve the Island’s biodiversity. Photo by Liz Corry. The results showed that only a very small percentage of the children interviewed were aware of the red-billed choughs in Jersey. A proportion of the children guessed that it was a bird, but hardly any knew that choughs were living on the same island as them. In fact, I had a lot of children reading their questionnaire and asking me “what is a cough?” accompanied by some fantastic drawings of what the children believed the choughs to look like including sloths, hedgehogs, monkeys and even a unicorn! Likewise, most teachers confessed that they did not know about the project. After the educational presentation, the results showed a huge increase in knowledge and understanding both of the choughs as a species and its history in Jersey. 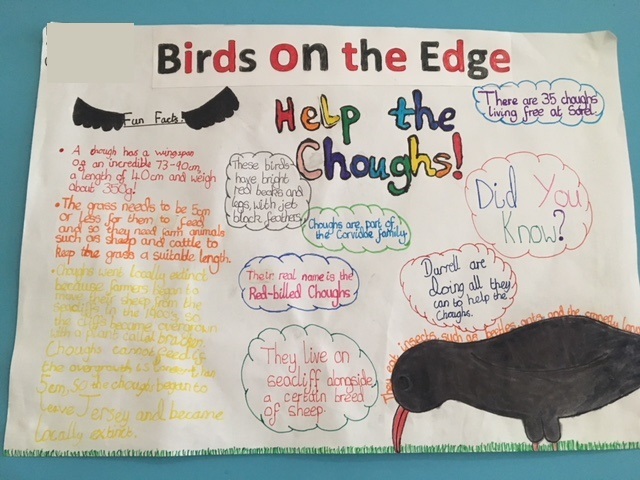 In their post-taught questionnaires, many children mentioned how the choughs became locally extinct, the habitat and resource needs of the choughs and what Birds On The Edge is doing to help. In addition, after the visits, there was some evidence of children sharing their new found knowledge of the red-billed choughs with other parties. This included two boys attending the chough keeper talk at Jersey Zoo, given that day by the Head of Birds, and practically presenting it for him! There were other cases of children telling their parents and one child even identifying a chough on a family walk in St John! 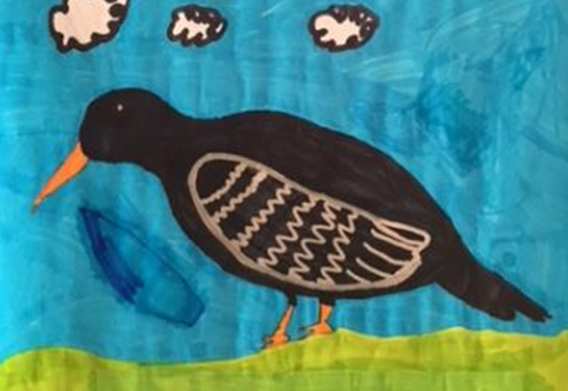 This is very encouraging news, demonstrating how children can act as a catalyst for change by sharing their knowledge to influence their friends’ and family’s actions which affect conservation matters and help protect the choughs. Moving forward, it would be fantastic to do more in-school workshops. Only a small percentage of the children in Jersey took part in the study but it showed how children can be massive assets for increasing awareness. It would also be great for teachers to include the choughs in more of their own lessons; a fantastic example of animals and their habitats which is a part of the Year’s 3, 4, 5 and 6 science curriculums. However, teachers had concerns about the time available to them to teach their classes about the choughs (particularly Year 6 teachers who face the pressure of SATs). To overcome this, we could provide schools with more resources, for instance red-billed chough reading comprehension resources: infiltrating classes without directly teaching about choughs whilst remaining focussed on the children’s upcoming exams. 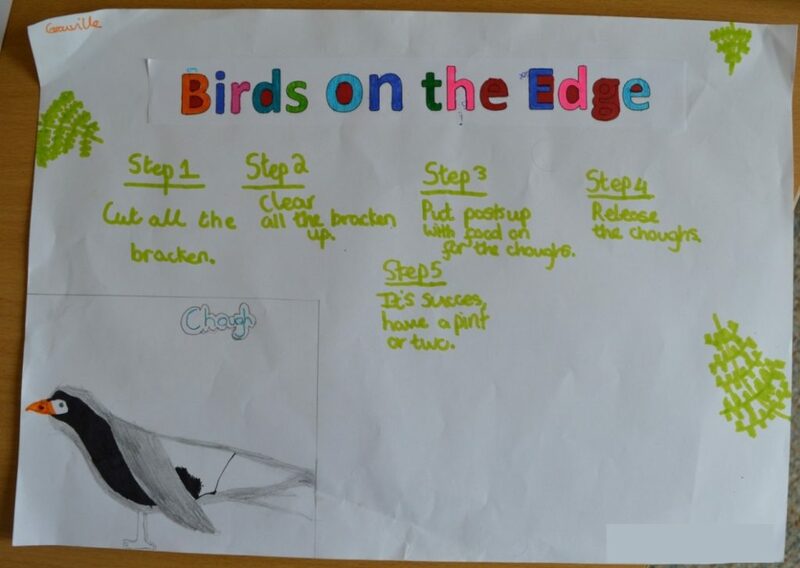 As part of my workshops the children created posters to inform the public of Jersey all about the red-billed chough population, all completed posters were entered into a competition and were judged by a member of the Jersey Zoo education team. Grouville Primary School had the winning poster and the class had the opportunity to visit the choughs at Sorel. The winning poster designed by a group of children at Grouville Primary School. Photo by Catherine Firth. Grouville children are clearly cut out for careers in conservation! Photo by Catherine Firth. If only conservation were that easy! Catherine Firth carried out this research for her MSc in Endangered Species Recovery and Conservation at Nottingham Trent University. 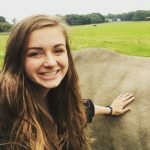 She is currently working as a Conservation Knowledge intern at Jersey Zoo.